The Ditto X2 is the natural evolution of Ditto Looper. Ditto X2 is for when you want to get serious about looping, but without sacrificing that signature-simplicity that guitar players know and love from Ditto Looper. It features a dedicated Start/Stop button, new looper effects, and loop import/export and backing tracks. Add a Blucoil 9V 670mA DC (-centre) Power Supply with US Plug: The Blucoil 9V 670mA DC Power Supply with US Plug, 3 meters cable, powers your pedals and ensures that your devices receive the right amount of power. Add Hosa CFS-106 Molded Right-Angle Guitar Patch Cable: The 6-inch guitar patch cable features nickel-plated plugs for rugged durability and efficient signal transfer and Oxygen-Free Copper (OFC) conductors for enhanced signal clarity. The OFC spiral shields for effective EMI and RFI rejection and flexibility. HIGH QUALITY AUDIO: With its ultra simple design, the Ditto Looper X2 has guitar centric features such as high quality audio, true-bypass, analog dry-through, and five minutes of looping time. 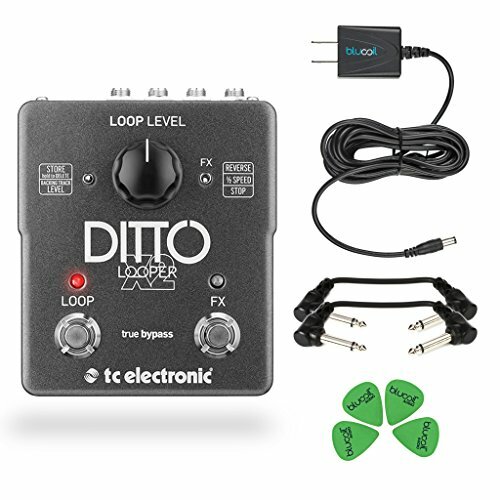 LOOP EFFECTS: Ditto Looper X2 allows you to play loops in reverse, half-speed or both at the same time. BLUCOIL 9V 670mA DC POWER SUPPLY: The Blucoil 9V 670mA DC Power Supply with US Plug powers your pedals and ensures that your devices receive the right amount of power. HOSA CFS-106 MOLDED RIGHT-ANGLE GUITAR PATCH CABLE: The guitar patch cable features nickel-plated plugs for rugged durability and efficient signal transfer and Oxygen-Free Copper (OFC) conductors for enhanced signal clarity. BUNDLE INCLUDES: TC Flashback Delay, Blucoil 9V 670mA DC (-centre) Power Supply with US Plug, 4 Blucoil Guitar Picks, and Hosa CFS-106 Molded Right-Angle Guitar Patch Cable.